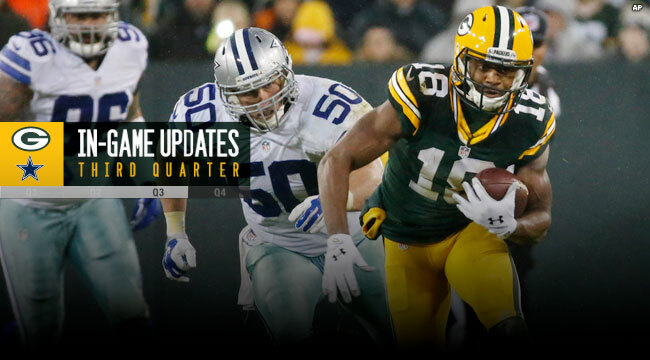 GREEN BAY — A four-play, 80-yard touchdown drive by the Cowboys left the Packers leading 14-7 when the third quarter of Sunday’s game at Lambeau Field ended. A 45-yard run by Darren McFadden, a 22-yard dash by Robert Turbin and a 7-yard touchdown run by Turbin on consecutive plays allowed the Cowboys to cut the Packers’ lead to seven points with 8:25 left in the third quarter. The Packers failed to convert a third-and-1, again, late in the quarter. It left the Cowboys with the ball at their 20-yard line with 1:28 to play. Eddie Lacy compiled 73 yards rushing heading into the fourth quarter.